For more monochrome participants, please visit the home of Monochrome Weekend. Black lace trees and a silver moon - what more could anyone want? Beautiful. That is such a beauty! The trees are budding and a moon rests right on top! One to be pleased with. Great photo, lots of detail for a night photo. Cool! Simple and very good! I love the texture made of the threes. I always love to go out during full moons; lay on the grass with my dog and just stare at it, wonderful! I can hear the wolves howling! Bright ball among the branches. The spring moon - I hope to see it as soon as th clouds go away. Lovely..there must be an owl hooting somewhere!! Have a wonderful weekend and a blessed Easter! 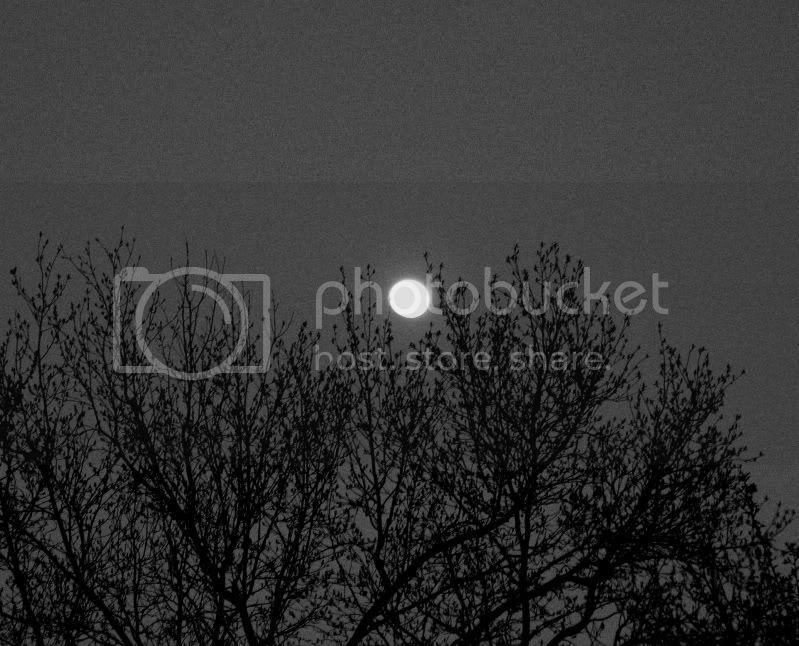 I really love the tree and moon outline on the grey background. Beautiful sky shot! Very nice. I'm a fan of night photos and black and white.